Now if you are a fan of Glee, you probably thought of their mash-up episodes when you read that. (I love Glee!) But instead of bringing you a song, I am bringing you a card for a new challenge blog called The Friday Mash-Up. I just had to play because the name itself is so much fun! I won a stamp set from There She Goes Clear Stamps, and instead of choosing my own, I had them pick one out and surprise me. I received it in the mail today, and I loved it! So I opened it up and made a card for this challenge. Isn't this a great card for someone who is going through a difficult time? I think that's one of the nicest reasons to send a card. There's nothing like a handmade card to make someone just a little happier. Brenda, your card is very pretty and so elegant! Thanks so much for playing with us at the Friday Mashup!! 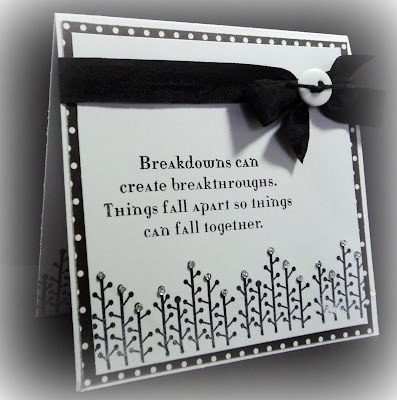 What a great sentiment for someone having a hard time.. Their stamps are always so witty with their sayings too.. Great card for the Mashup! I love the black ribbon with the white button so elegant! 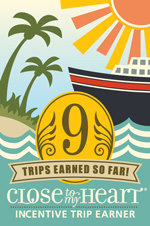 Thanks for joining us this week. You have done wonderful job with the challenge! That is a lovely saying for someone going through a hard time! Thanks for joining us at the Mashup! Wow, gorgeous card!! I love that saying, and the rest of the card just accents it beautifully. 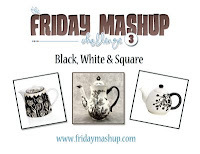 Thanks so much for playing along with us at The Friday Mashup! Wow! Great, elegant design! Such a lovely sentiment! 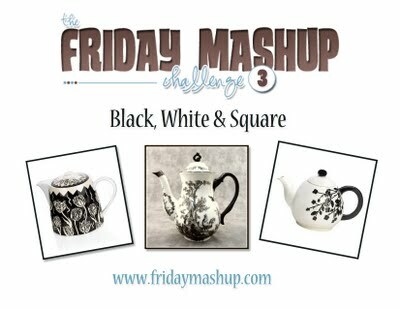 Thanks for playing with the Friday Mashup!